We are in the midst of a change of seasons as cool winter temperatures begin to give way to the warmth of summer. Just as weather patterns ebb and flow from season to season, so do the workloads of CSIA Certified Chimney Sweeps. 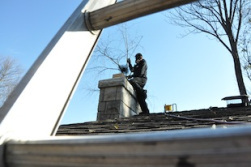 So what kind of chimney issues should homeowners have top of mind each season? Here’s, what we hope is, a handy breakdown for you to consider. SPRING: The season we’re in right now, we just recently blogged about the most pressing chimney issue each spring – water damage. Spring rains can wreak havoc on your chimney, causing damage that can impact how it operates and the level of safety it provides. And, in cases where the damage has already been done, spring rains can reveal leaks and other problems that may have been hidden in previous months. SUMMER: Summer, most chimney sweeps will tell you, is the best time of year for repair work and other extended service jobs. Each summer, phone calls for annual chimney inspections traditionally taper off, and this leaves more chimney pros available for bigger projects, like masonry repairs, that often require more time and work. Plus, more sunshine and longer days also benefit these kinds of projects. FALL: As cooler temperatures creep in, thermostats are switched to heat and fireplaces are lighted after months of laying quiet. Before you put your home’s chimneys to use each year, an annual inspection of your appliance by a CSIA Certified Chimney Sweep is a must. Demand for sweep services is the highest at this time of year, because home heating is again top of mind. So, schedule those inspections as early in the season as possible. WINTER: Hopefully, by now, you’ve already had your chimneys inspected in advance of the home-heating season. Unfortunately, chimneys have been out of sight and out of mind in the summer months, and many don’t think of their chimneys until there is a problem. This is why winter is the season of emergency repairs. Furnaces and fireplaces are likely to be relied on heavily during the coldest months, and problems will surface when the appliances are under the most consistent stress. For the most efficient and effective repair response, make sure you contact a CSIA Certified Chimney Sweep.